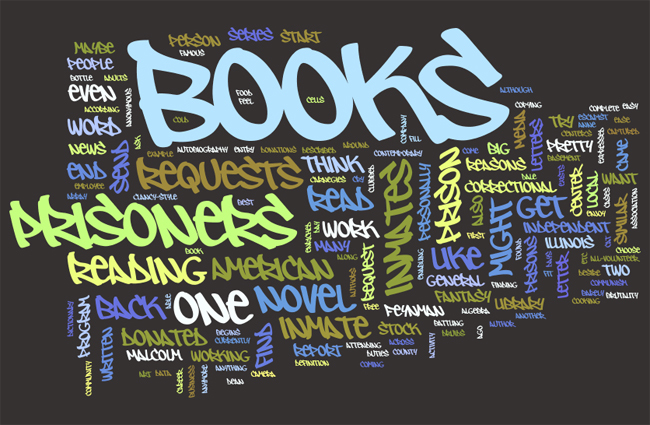 UC Books to Prisoners is an Urbana, IL based project providing books to Illinois inmates at no cost. Books to Prisoners offers books by mail to all Illinois inmates and operates lending libraries in the two Champaign County jails. Is your book collection weighing you down? Do you have a home library that is threatening the structural integrity of your abode? Champaign-Urbana has many great places to donate books. One of the neediest is the Books to Prisoners program, profiled earlier in a Smile Politely piece. We take donations of used books from the community, mail books in response to prisoner requests, and stock and staff the two local jail libraries. Those books that are not suitable for prisoners, for a variety of reasons, are sold to cover the postage to mail books. Thanks to community support, we have sent 32,162 books in 8,281 packages to 5,096 inmates since we were founded five years ago. Go here for details about dropping off books. If you’d like to get rid of your books, merely to make space to acquire more, come to our Spring Book Sale April 3–5 at the IMC in the old Urbana Post Office. A huge assortment of high quality books: paperbacks at 50 cents, hardbacks for a buck. This entry was posted in Uncategorized and tagged community, education, literacy, literature. Bookmark the permalink.